Steven Culp Online | Sam Serman in "The Last Word"
Steven Culp in "The Last Word"
Universal Studios Home Entertainment has announced that it will release on Blu-ray director Mark Pellington's fillm The Last Word (2017), starring Shirley MacLaine, Amanda Seyfried, Anne Heche, Tom Everett Scott, and Thomas Sadoski. The release will be available for purchase on June 6. There are no special features listed on the current press announcement. 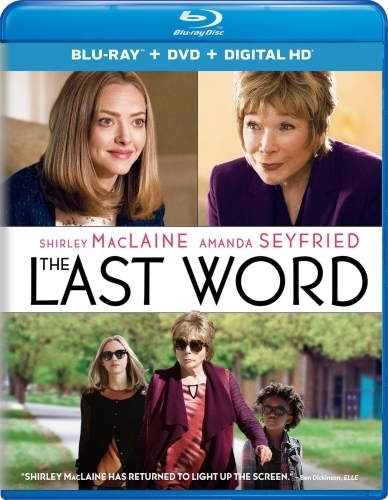 Myriad Pictures has announced a slew of sales for The Last Word, Mark Pellington's film starring Shirley MacLaine and Amanda Seyfried. The pic is in postproduction, and the company is showing first-look footage at Cannes. The deals cover Germany (Tobis), Spain (SecondGen), Italy (Teodora), Switzerland (Praesens), Japan (Pony Canyon), Canada (Elevation), the Middle East (Eagle Films), Greece and Turkey (Tanweer), Portugal (Cinemundo), South Africa (Ster Kinekor), South Korea (Main Title), the Philippines (ABS-CBN), Taiwan (VieVision) and airlines (Jaguar). Bleecker Street bought rights in November to the US, Scandinavia, Benelux, Latin America, and Eastern Europe. The pic follows a highly successful former businesswoman (MacLaine) who has micro-managed every single aspect of her life and assigns a local writer (Seyfried) to write her obituary. When the first draft doesn't meet her expectations, the woman sets out to rewrite her life's story before it's too late. Logline: Retired businesswoman Harriet, controlling to the end, writes her own obituary, but the newspaper writer tasked with the piece insists on learning the truth about Harriet's life and the two become reluctant partners and friends. SSN Insight: Mark Pellington is the executive producer on NBC's Blindspot. He also directed the features I Melt with You, Henry Poole is Here and the documentary U2 3D among others. Bleecker Street announced production has begun on Mark Pellington's, THE LAST WORD, written by Stuart Ross Fink. Academy Award® winner Shirley MacLaine (Terms of Endearment) and Amanda Seyfried (Les Misérables, Mama Mia!) began filming on Saturday, February 6th, 2016. Myriad Pictures is handling international sales on the film, continuing with this week's European Film Market (EFM) in Berlin. MacLaine plays a retired businesswoman who wants to control everything around her, including her own obituary, so she writes her own to ensure her life story is told her way. Seyfried portrays a young writer at the local newspaper who takes up the task of finding out the truth about MacLaine's character —resulting in a reawakening of passions for MacLaine's character, and a life altering friendship for Seyfried's. Rounding out the cast are a number of standout actors, including Anne Heche (Rampart, The Other Guys, Donnie Brasco), who plays MacLaine's estranged daughter; Philip Baker Hall (Argo, Bad Words, 50/50) as MacLaine's ex-husband; Thomas Sadowski (Wild, "The Newsroom") as a local DJ; and Tom Everett Scott (Race to Witch Mountain, That Thing You Do!) as the editor of the local newspaper. 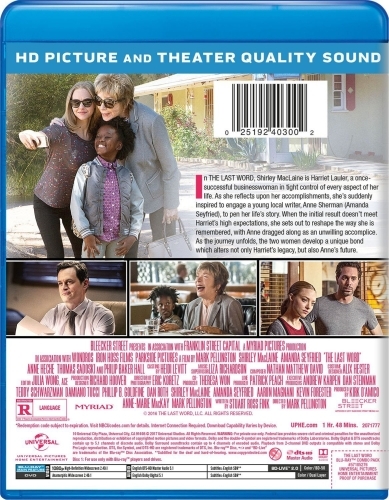 The film is directed by Mark Pellington (Arllington Road, The Mothman Prophecies) and produced by Kirk D'Amico (The Disappearance of Eleanor Rigby, Margin Call) of Myriad Pictures, Anne-Marie MacKay of Wondros, and Pellington. The film is financed by Myriad Pictures, Franklin Street, Media Capital Group, and Pacific Mercantile Bank. The film is executive produced by Bleecker Street's Andrew Karpen, Franklin Street's Dan Steinman, Danny Roth and Damiano Tucci of Parkside Pictures, and Myriad's Kevin Forester. Also serving as EPs are Aaron Magnani, MacLaine and Seyfried. Bleecker Street is proud to announce it has acquired U.S. distribution rights to Mark Pellington's upcoming dramedy, THE LAST WORD, written by Stuart Fink. Academy Award winner Shirley MacLaine (TERMS OF ENDEARMENT) and Amanda Seyfried (LES MISÉRABLES, MAMMA MIA!) are attached to star. The film will be directed by Mark Pellington (ARLINGTON ROAD, THE MOTHMAN PROPHECIES) and produced by Pellington, Anne-Marie MacKay of Wondros and Kirk D'Amico (THE DISAPPEARANCE OF ELEANOR RIGBY, MARGIN CALL) of Myriad Pictures with Aaron Magnani serving as executive producer. Andrew Karpen, CEO of Bleecker Street remarked, "When I read Stuart's funny and touching script, I instantly saw Shirley MacLaine and Amanda Seyfried in the roles of these two amazing women. I'm excited to see Mark Pellington bring this story of reflection, personal legacy and self-truth to life." Producer Kirk D'Amico said, "We're thrilled to have Bleecker Street onboard to bring this film to theaters across the US. They do a great job of bringing sophisticated and fun films like this to audiences. We are excited to see Amanda and Shirley shine in these roles and know that Mark will create a fantastic film." The deal was negotiated between Kent Sanderson, President of Acquisitions & Ancillary Distribution for Bleecker Street, and Kirk D'Amico of Myriad Pictures and UTA Independent Film Group on behalf of the production. In THE LAST WORD, Shirley MacLaine is Harriet Lauler, a once successful businesswoman in tight control of every aspect of her life. As she reflects upon her accomplishment, she's suddenly inspired to engage a young local writer, Anne Sherman (Amanda Seyfried), to pen her life's story. When the initial result doesn't meet Harriet's high expectations, she sets out to reshape the way she is remembered, with Anne dragged along as an unwilling accomplice. As the journey unfolds, the two women develop a unique bond which alters not only Harriet's legacy, but also Anne's future.